If you're installing InstantForum on a shared hosting account you may not have the option to install InstantForum within a dedicated IIS web application. Your hosting company may only allow one IIS web application for the root of your web site. This article only applies if your not able to install InstantForum within the root of a IIS web application / virtual directory also sometimes referred to as application starting point. To install InstantForum in a standard child directory of a IIS web site or web application you'll need to follow the steps below. 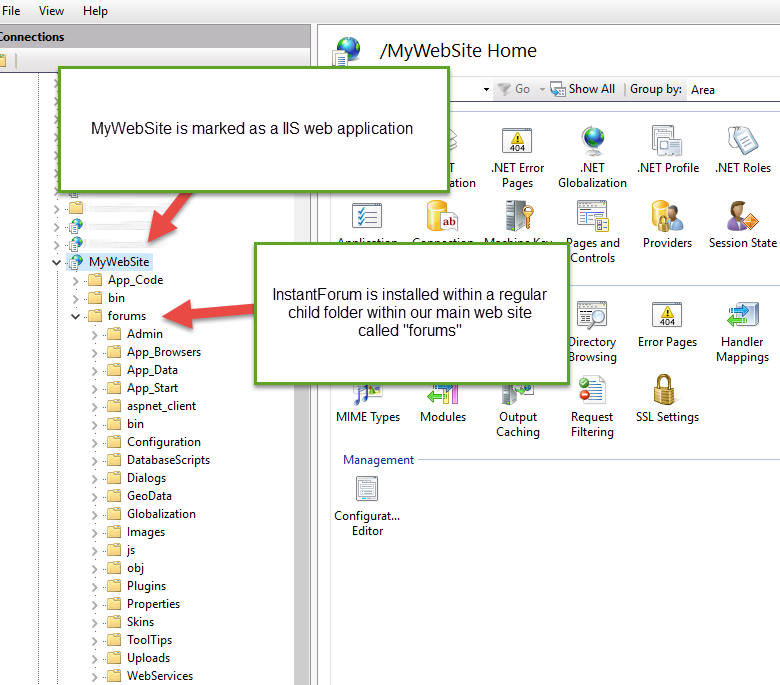 As you can see the "MyWebSite" folder is our IIS web application / web site root and InstantForum is installed in a standard child directory called "forums" - this is not a web application. The name of the child folder you choose to install InstantForum to is important as we'll need to add this into your main web sites web.config file. You'll need to copy all .NET assemblies used by InstantForum into your root /bin directory. We would suggest simply copying the InstantForum/Bin folder into your main web site. If your main web site already contains references to assemblies used by InstantForum such as "Microsoft.AspNet.Identity.Core.dll" we would suggest leaving your existing versions in place and only copying the assemblies from InstantForum that don't already exist in your main web site. Ensure you leave the "InstantASP_Licenses.config" file within the forums\bin folder. to MVC 3 so libraries such as DotNetOpenAuth that compile against MVC 1 will work with it. This will ensure our HTTP modules are able to find the configuration & localization files. IMPORTANT: You can leave the InstantForum web.config file within the "forums" standard child folder however you will need to remove each of the tags we've copied into your main web sites web.config file. For a description of web.config changes see https://go.microsoft.com/fwlink/?LinkId=235367. which is necessary for OpenID urls with unicode characters in the domain/host name. You can optionally add the InstantForum database connection string to your web sites web.config file.This is only needed if you wish to references our assemblies from your website code and use our .NET API to query data from your own web application. You'll need to add the following HTTP Modules to your root web sites web.config file. This should be placed inside the <System.Web> element. You may need to remove the following tag from the forum web.config file if the forum is installed in a standard child folder. You should ensure this tag is present in your root web.config. InstantForum requires forms authentication to be enabled. From within your InstantForum folder you will need to move the following files into the root of your web site or in this example the root of our MyWebSite folder. Move the App_Code from within InstantForum into your main web site folder. Again you would move or cut the App_Code folder and Global.asax and Global.asax.cs files from within the InstantForum folder into the root of your main web site. The App_Code folder and Global.asax need to exist at the root of your IIS web application which in this example is our MyWebSite folder. To help demonstrate this we've enclosed a sample download below. This download only contains the files you would need to modify and does not contain a full InstantForum download. I hope this information has been helpful. As always if you have any questions please don't hesitate to contact us.